Oil markets care trading flat to slightly lower this morning. Crude prices gained $1.43 yesterday, supported by a bullish EIA report, and closed above $62/bbl for the first time in almost 3 weeks. 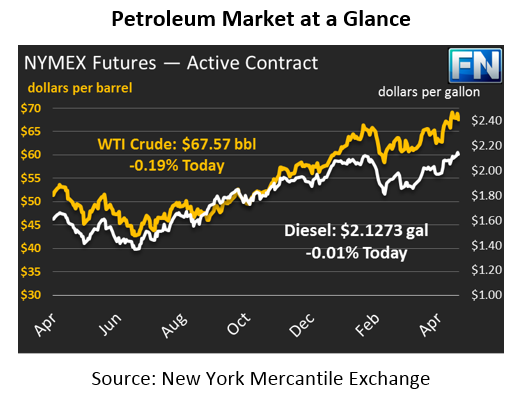 Today, crude prices are down slightly but remain above $62, with prices down 4 cents (.06%) to trade at $62.73. Fuel prices also moved higher yesterday and like crude, closed the day with the highest prices since the first week of this month. Diesel posted gains of 2.2 cents and gasoline prices rose by 1.4 cents to close the day at $1.9527 and $1.7657 respectively. Both products are trading mostly flat this morning, giving up just a few points since yesterday’s session. 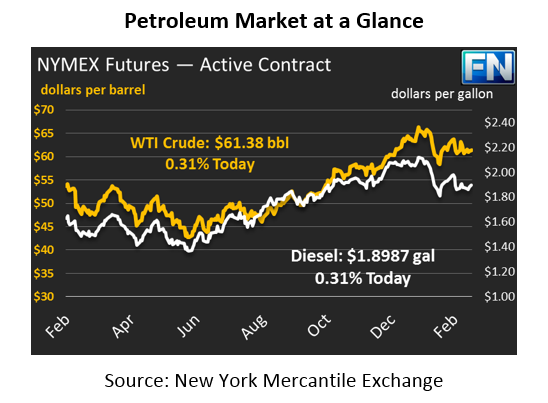 Diesel prices gave up nearly half-a-cent today and is currently trading at $1.9481. Gasoline prices are $1.7326, just 7 points below yesterday’s closing price. 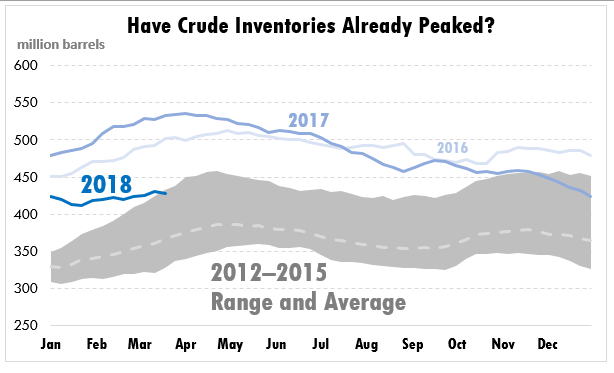 Yesterday, the EIA released its weekly report on U.S. inventory levels. Crude posted a draw of 1.6 MMbbls which came as a surprise to the market that was expecting 1.8 MMbbls inventory build. Net exports rose to 2.04 MMbpd – the second highest weekly level ever after the 2.1 MMbpd record set back in October 2017. At the same time, net imports fell by 867 kbpd to 7.02 MMbpd. These factors combined contributed to the draw in inventories during a time that inventories historically build. Refined products also saw a combined net draw with diesel reporting a larger than expected draw of 2.4 MMbbls. Gasoline posted a small build of 0.3 MMbbls, bringing net product inventory levels to -2.37.